Opening in July of 2002, the Beach Club Villas was the fourth Disney Vacation Club resort to open at Walt Disney World. Themed to the charming cottages of the early 20th century, Beach Club Villas offer a tastes of the seaside air and stunning views of the 25-acre Crescent Lake that are sure to bring a smile to guests. 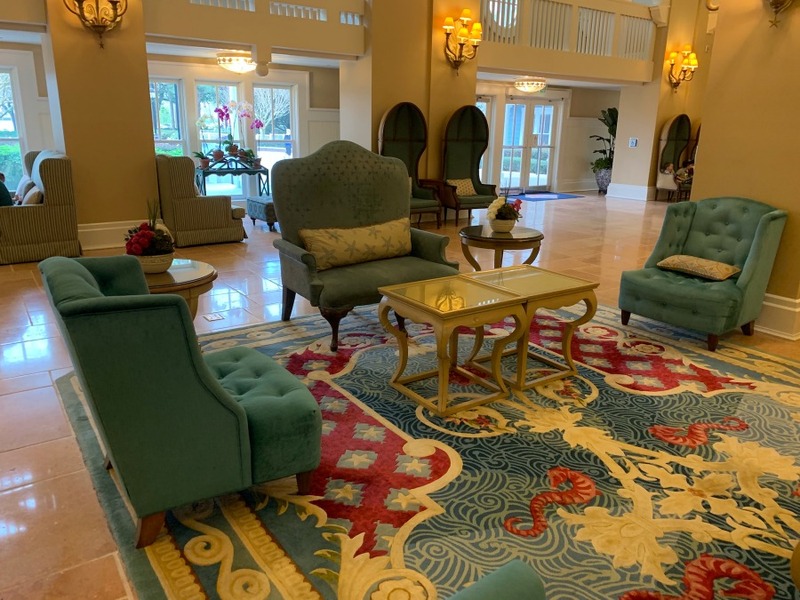 Disney Vacation Club (DVC) serves as Disney’s form of a timeshare in which members purchase a real estate interest in a DVC resort. Membership is represented by an annual allotment of vacation points that may be used at any time of the year, banked for future use, or even rented privately to other guests. Points can be redeemed at any of the DVC resorts or other destinations across the globe. 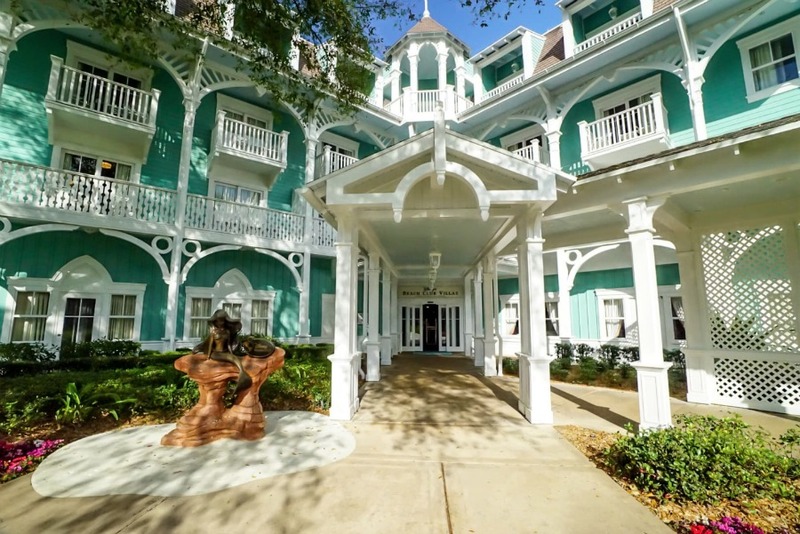 The Beach Club Villas were designed by architect Robert A.M. Stern, who also designed Disney’s Yacht and Beach Club Resorts, Disney Boardwalk, and the Feature Animation Building at Walt Disney Studios. Likewise, Stern crafted two hotel properties for Disneyland Paris - Hotel Cheyenne and Newport Bay Club Hotel. Many of these properties are similar in design and theme especially Beach Club Villas and its sister resort, the Yacht Club. Both resorts are reminiscent of the shingle-covered vacation destinations popular on the East Coast: the Yacht Club draws inspiration from New England towns like Newport and Bar Harbor while the Beach Club and its Villas are modeled after those that could be found in towns like Cape May, New Jersey. TIP: Take time to look at the small gardens at the Villas. You’ll notice a familiar mermaid friend just outside the entrance welcoming you to this beach-themed resort. The exterior of the Beach Club Villas is impressive upon arrival; it sits on six acres of land just adjacent to the Beach Club Resort. The Victorian white trim flowing throughout the sea green siding is picturesque. Well-manicured gardens and tall cast iron lamp posts catches the eye. Once inside, pastel greens, blues, and even touches of cream compliment the beach motif. The Villas boast more seating areas than most resorts on property, and they are definitely worth exploring. Photographs, oil paintings, and seaside knick-knacks populate the shelves amidst high vaulted ceilings, subdued lighting, plush chairs and antique-style sofas, and fresh-cut floral arrangements. 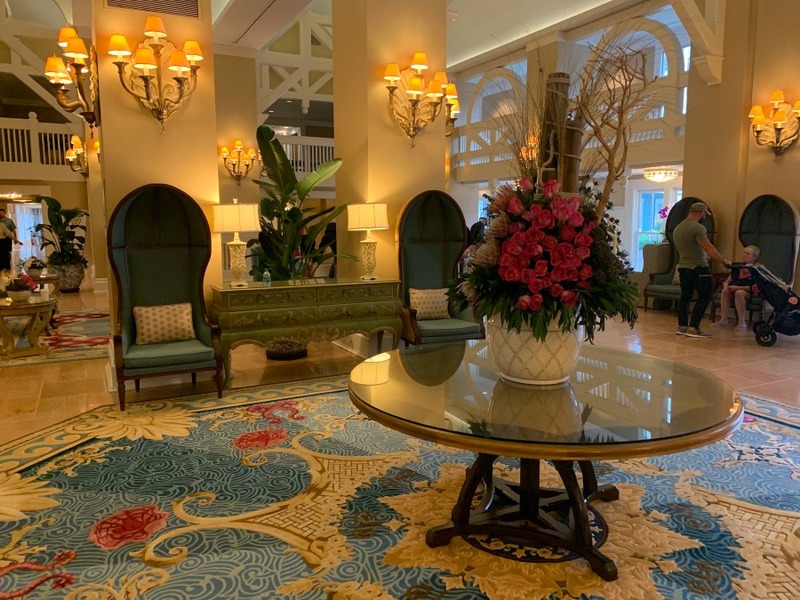 The Solarium, Drawing Room, and Breezeway are all fantastic locations to escape the Florida heat and enjoy some downtime away from the theme parks. TIP: Take your time looking around the three seating areas of the resort. The seaside artifacts are fun to examine including the various weathervanes in the Breezeway. TIP: The best views are from the upper floor rooms overlooking the Dunes Cove pool. If you are more interested in a location closer to parking rather than a nice view, request a first floor room on the non-pool side. Square Footage: Deluxe Studio: 356 sq. ft.,	1 Bedroom Villa: 726 sq. ft.,	2 Bedroom Villa: 1083 sq. ft. Basic Room Contents: All rooms come with an alarm clock with mp3 player, ceiling fan, coffee maker and coffee setup, table and chair, DVD player, hair dryer, safe, iron and ironing board, pack ‘n play crib, telephone and television. Deluxe studios come with a kitchenette (mini fridge, microwave, sink, toaster and wetbar). The bedroom villas come with a kitchen (full-size refrigerator, microwave, stove, oven, toaster, blender, dishwasher, glasses, flatware, plates, cookware, sink and tea kettle) as well as a washer and dryer, high chair, vacuum cleaner and whirlpool tub. A beach motif is represented in the sunny color scheme and laid-back style of the villas. Muted tones of green, peach and blue are central in decor. Seaside icons such as lighthouses and shells are sprinkled throughout. The rooms have French doors leading to a patio or balcony. All recreation options for those staying at the Beach Club Resort are available to guests of the Villas. This includes access to Stormalong Bay, a three acre pool complex with a waterslide, lazy river, three whirlpool, and white sand bottom. Guests can also enjoy the Tidal Pool, a beach volleyball pit, bicycle rentals, the nearby miniature golf course, dining options, shopping, and more.